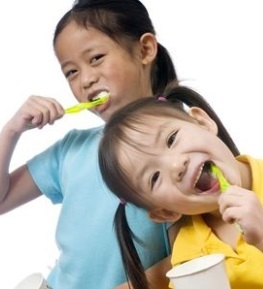 If you’re like most parents, cavities are one of the main concerns you have when taking your kids to the dentist. You probably know that regular brushing can help prevent cavities, but in the video below, Dr. Steven Pike explains 3 alternative ways you can use to lower your child’s risk for getting cavities. Hi, this is Dr. Steven Pike and today I would like to talk with you about some alternative ways to prevent cavities. Traditionally we have all heard about preventing cavities by brushing with fluoride toothpaste and eating sugar less often. Those are very valid techniques but oftentimes people find that even by trying those techniques it still does not work and they still get cavities. These are some other things that you can do that will help to lower your risk of getting cavities. There are several different ways to use baking soda. You can make a mouthwash. Get a glass of warm water and add baking soda until you can’t dissolve anymore, then rinse it in your mouth for 30 seconds, spit it out and do not rinse it out with fresh water. Do this every night before bed. Is Baking Soda Safe For Kids To Use? It is safe for both kids and adults but I am only speaking towards children here. If you are an adult and you are in a medically complicated situation you should probably talk to your primary care physician of course. How Much Baking Soda Should Be Used? You will make a supersaturated solution. To do this get a half cup of water, keep adding baking soda until you can’t add any more. If you don’t wish to do that you can take the toothpaste that you use, put it on the toothbrush and then dip the toothbrush into some baking soda and just brush your teeth like that. That will work great too! There are a lot of different ways that you can use this and they will all work just fine. Is It Better To Use Baking Soda As A Paste Or A Liquid? You can use it as a paste or a liquid, either way is fine. Just get the baking soda on the mouth, it will raise the PH of the mouth and encourage the growth of the good bacteria and discourage the growth of the bad bacteria. You can use a product that has arginine in it. Arginine is an amino acid which is naturally found in the body. They are starting to add this as an ingredient in some toothpaste. These toothpastes are being sold for the relief of sensitivity but they work great for preventing cavities. How Does Arginine Help Prevent Cavities? The way that arginine works is that it raises the PH in the mouth. When you raise the PH in the mouth it promotes the growth of good bacteria and it makes it an inhospitable environment for the bacteria that likes to cause cavities. So you get more of the good guys and less of the bad guys. There are a few commercial products out there that have arginine and some are available by prescription only which we sell here in the office. There is also a Tom’s of Maine sensitivity relief product that does contain arginine and xylitol, which we will talk about next. This is a natural sugar which comes from birch trees. It was discovered in Finland and they found that people that use xylitol get fewer cavities. How Does Xylitol Work To Prevent Cavities? The way it works is that the bacteria that causes cavities, the streptococcus mutans, do not like to digest the xylitol. So we have less strep mutans with people that have six grams of xylitol per day. This is the difficult thing with xylitol, it has a threshold dose. So you need to have three servings of xylitol spread out throughout the day in order for it to be effective. If you don’t see that threshold you really don’t get the decrease in cavities. It doesn’t cause any harm but we don’t get the same benefit. Xylitol is an over the counter medication. It gets put in chewing gum, toothpaste and all kinds of products. It is also in a powdered form or a crystal form. You can go online and find all kinds of products. People that use xylitol well often buy this in bulk. They will go on Amazon or wherever and buy 1,000 pieces of xylitol gum and then after every meal, they will have 2 pieces of gum. In these people, it will not only get rid of the bad bacteria but it will also increase the flow of saliva which also has a preventive effect. All three of these products are similar in that they all promote the growth of good bacteria in the mouth. Good bacteria doesn’t cause cavities. If you have any questions about these products or you would like to discuss other products, please give us a call and come on in. We would love to talk to you about this! (503) 297-1711. Dr. Pike Dentistry For Children is a Portland pediatric dentist serving children throughout the metro area and Beaverton.